 Baked bell peppers with pizza stuffing (photo courtesy The Pampered Chef). 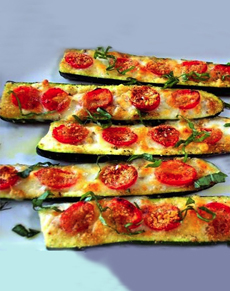 Another way to enjoy pizza toppings: zucchini-based pizza boats (photo courtesy Lucero Olive Oil). For a crust-free experience, use this as inspiration: pile up the vegetables and use less cheese. This re-creation of Goldberg Pizzeria’s SMOG is lovingly re-created by Grand Voyage Italy. Here’s the recipe. If your hope is to cut back on pizza carbs this year, here are three ways to enjoy pizza flavors without the crust. 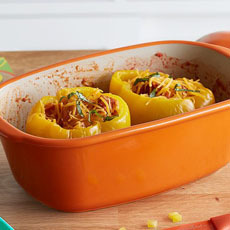 The first is the recipe below, a fusion of stuffed peppers and pizza toppings (photo #1). The recipe was adapted from The Pampered Chef. 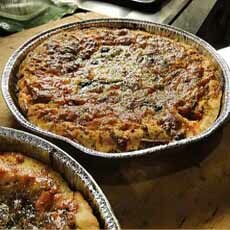 Next, here’s a crustless pizza variation we published several years ago with a zucchini base (photo #2). Finally, the easiest crust-free pizza from the legendary Larry Goldberg of Goldberg Pizzeria in New York City (closed in 2002). Larry had lost 150-plus pounds while surrounded by all that pizza. One of his pizza-eating tricks was the SMOG: sausage, mushrooms, onions and green (bell) peppers (photo #3). He heaped up the veggies in a pie plate, covered them with crushed tomato sauce and topped them with a small amount of mozzarella. It was such a great idea; why hasn’t it been knocked off by pizzerias everywhere? *If desired, use 1/4 cup mozzarella and 1/4 cup reduced-fat shredded cheddar cheese. 1. COMBINE the turkey, pizza sauce and rice in a small baking dish. Microwave on HIGH for 3 minutes, stirring halfway through cooking. 2. CUT the tops off of the bell peppers; remove the seeds and veins. Slice the tops into small pieces to yield ½ cup (125 mL) to add to the stuffing. Cut the pepperoni slices into quarters. 3. CAREFULLY REMOVE the baking dish from the microwave and place on a heatproof trivet. Add the cheese, pepperoni, bell pepper pieces, and any optional vegetables, and stir to combine. 4. SPOON the mixture into the bell peppers. Add water to the bottom of the baking pan, then add the bell peppers. Cover and microwave on HIGH for 7–8 minutes, or until the internal temperature of the mixture is 165°F (74°C) and the peppers are tender when pierced with a fork. 5. CAREFULLY REMOVE the baking dish from the microwave; it will be very hot. Remove the peppers and top them with the parmesan cheese and fresh basil before serving.